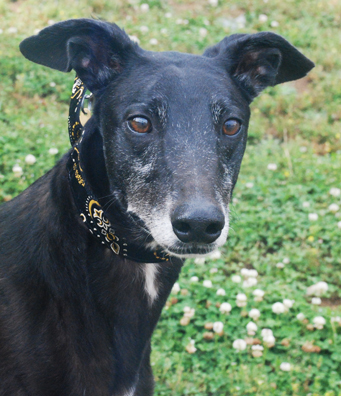 Hot Dog came from the track adoption kennel in Jacksonville Florida and he raced at 67lbs. This is a friendly, happy, calm boy that has been very well behaved since he arrived in his foster home. He is a grinner and will happily grin up at you when happy or excited. He is a gorgeous black male with white socks and a white chest. Very flashy! Hot Dog was born Nov 17th 2005. He was a very successful racer that won a lot of races and raced a long time. He crates well and quietly so might be OK as an apartment or townhouse dog. His foster mom was sick recently and he layed right by her side the entire time watching over her. He is just so sweet! He is very good with children.This is a dog that was suggested to us as one that would be a good family dog because he has been around the children of his racing trainer often and was very good with them. Even though he is calm he does have a silly side and is likely to play bow to you trying to get you to play with him. The play only lasts for a little while because Hot Dog is a typical greyhound couch potoato. Hot Dog needs a home without cats. He has been fine with the small to medium sized dogs he has met at meet and greets. He loves to play with other dogs though so might do better in a home without very tiny dogs just because he might accidentally step on one when playing. Typically our non cat friendly dogs take months longer to adopt than our cat friendly ones. If you do not have cats please consider adopting one of our sweet non cat safe dogs like Hot Dog.